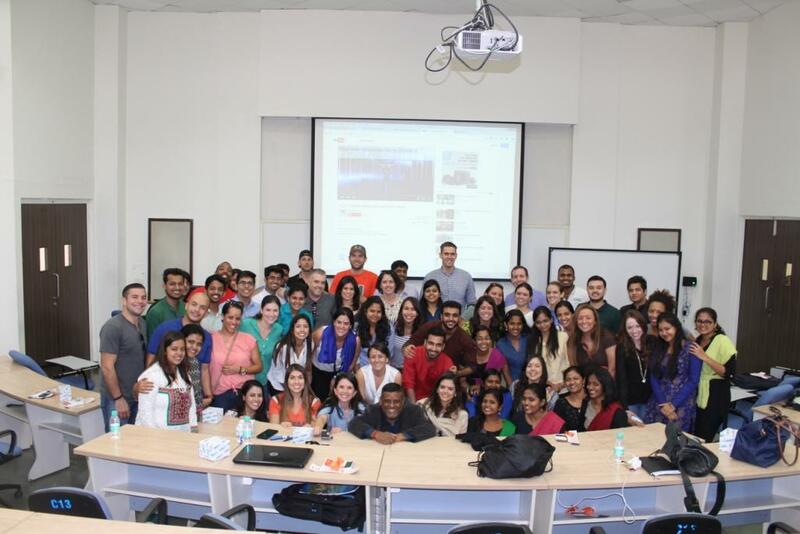 The students of University of Miami visited Great Lakes Institute of Management, Chennai, a leading B-School in India. Around 30 students from University of Miami comprising different nationalities visited Great Lakes as part of an international immersion program. The one day visit saw interaction between Miami and Great Lakes students and professors. The visit was aimed at understanding the current business scenario in India and to gain inputs on management curriculum at Great Lakes, in particular about the unique Leadership Experiential Program - Karma Yoga offered at Great Lakes. Dr. Suresh Srinivisan, professor at Great Lakes interacted with the students on Indian Business scenario, gaps and challenges of doing business in India. The Miami students were eager to know more on consumer- driven Indian economy, role of India in IT and services and how Indian legal system works. Dr. Suresh Srinivasan answered their questions with relevant examples and made it more interesting. Followed by this Q&A session, there was a case study challenge between eight teams which consisted of Great Lakes and Miami students. The students deliberated on the case before the challenge and brought different perspectives to the table. It was interesting to see how a multi - demographic group can collaborate and perform in a situation like this. The arguments were productive and at the end of the session, every student felt the case study challenge helped them understand problem-solving better. As an integral part of this visit, the Miami students visited villages which have been adopted by Great Lakes for its Karma Yoga program. Great Lakes Karma Yoga is a vital part of the Post Graduate Program in Management (PGPM) and Post Graduate Diploma in Management (PGDM). The project is a unique medium for students to connect with ground realities and experientially learn transformational leadership. A one of its kind programs in India, students of Great Lakes have been empowering villagers from 21 villages adopted by Great Lakes around the campus, by aiding them in livelihood skills training. The students of Miami University visited these villages and interacted with villagers and Great Lakers to learn more on Karma Yoga program and how Great Lakers have gained knowledge through this project in the form of real life challenges and situations faced. A student of Miami and a Spain national, Ted explained how he found Karma Yoga activity so fulfilling. “It is amazing to see what Great Lakers have been doing in these villages. This is a unique curriculum and it sure provides a different perspective towards management. It makes a person socially responsible and to be more concerned about the less privileged. I belong to a different part of the world and what is I see here is reality, he added.